The Corporation of Point Grey was established on 1 January 1908 under the authority of a Provincial Letters Patent of 18 December 1907. The Point Grey District Municipality had formerly been a part of the Corporation of the District of South Vancouver from its inception in 1892 until 1908, and amalgamated with the City of Vancouver (as did South Vancouver) on 1 January 1929. The 1908 geographic boundaries of Point Grey were thus all areas south of 16th Avenue on the west side of the previous South Vancouver District, approximately from Camosun Street to Cambie Street. 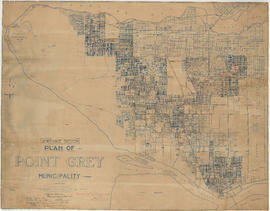 The Corporation of Point Grey had five continuing areas of responsibility, derived from the Municipal Act (S.B.C. 1872, Ch. 35) and the Municipal Clauses Act (S.B.C. 1896, Ch. 37) as well as other legislation affecting municipalities. These responsibilities were: the control of land use, development of public works, ensuring public safety, providing for public welfare, and the control of public finances. The Corporation was organised administratively into a Municipal Council and a number of Standing and Special Committees, as well as a Municipal Clerk. The Clerk also acted as Returning Officer for the Municipality. Council was comprised of a Reeve (Mayor) and Councillors, who from 1909 were elected by their respective Wards. In 1909, there were five Councillors and this expanded to seven by 1928. The responsibilities of the Corporation were chiefly carried out by the Standing Committees, whose number and composition varied. In 1908, there were six such committees: the Board of Works, charged with the regulation of public land use and the construction and maintenance of roads; Health and Police, charged with the regulation of sanitation, public health, which was overseen by an appointed Medical Health Officer, and the administration of justice including policing and the operation of Municipal and Juvenile Courts; Light and Water, responsible for the provision of public lighting and water; Subdivision Plans and Parks, responsible for the development of town planning, the regulation of private land use and the acquisition and maintenance of municipal parks; Finance, responsible for the assessment and collection of taxes as well as the control over public finances; and License, responsible for the granting of licenses. Responsibility for licensing was delegated later in 1908 to a Licensing Board comprised of two Council members and two appointed Justices of the Peace. In 1915 [? ], the administration of justice was removed from committee and became the responsibility of the Board of Police Commissioners, which was comprised of two members of Council and a third appointed individual. From 1916 the composition of committees remained essentially the same: Board of Works; Water; Sewers and Health; Parks, Boulevards and Plans; Light and Fire; Finance; and Transportation and Industries. In 1920, Housing was added to the responsibilities of the latter. In 1926, a Local Improvements Committee was established. As a Committee of the Whole, Council itself was responsible for By-laws, the approval of public expenditures, and the consideration of recommendations put forth by committees and individuals. Further, it was responsible for annual ordinary expenses of the Point Grey School Board such as teachers' salaries and the operating costs of schools. Council also considered School Board requests for extraordinary expenses. For a more detailed history, please consult the inventory to the Corporation of Point Grey fonds. For a small volume of material of the Reeve J. Alexander Paton (1925-1928) see series 469 within the City Councillors' Office fonds (because Paton also served as Alderman of the City of Vancouver 1929-1930). For the records of the other jurisdictions which all joined together on January 1, 1929 see also the Corporation of the District of South Vancouver fonds, and all other City fonds which relate to the period up to 1929. Sousfonds consists of the following record series relating to the local government functions of the Corporation of Point Grey (in existence 1908-1928).